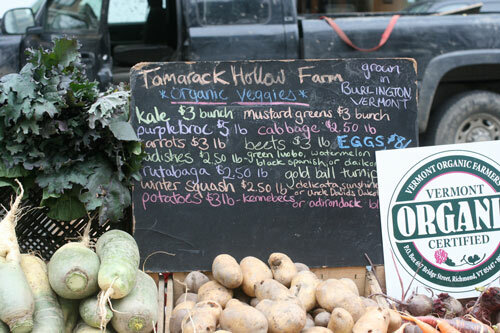 “I LOVE YOU, BACON,” proclaims the sign at Tamarack Hollow Farm—but as Mike Betit told me last week, “We only put it up when we actually have bacon.” Tamarack Hollow, located in Burlington, VT, started out as a hog farm, although they now also sell a small but unique selection of produce. Betit credits the tanking economy for the change in their approach at the market. “People just weren’t buying high-priced protein. 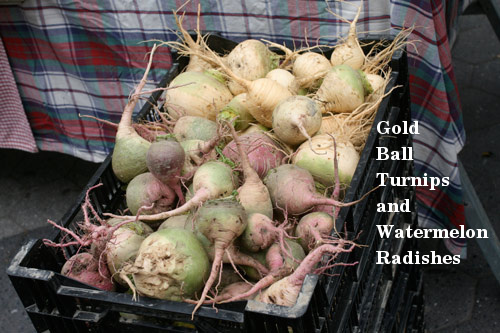 It was one of the first things they cut.” That loss ended up being the market shoppers’ gain, as in addition to Tamarack’s beautiful smoked and fresh meats and sausages, Betit’s current produce selection includes greens, cabbages, broccoli, turnips, radishes and more. Betit’s wife, who used to work for Keith Stewart of Keith’s Farm, chooses which crops to grow. 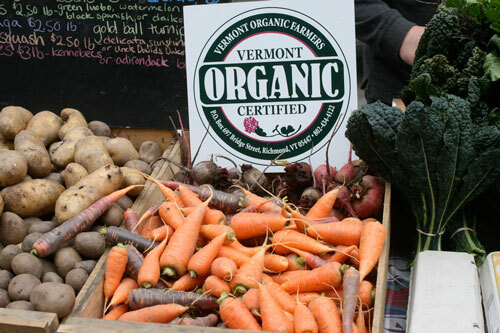 Tamarack Hollow goes beyond organic certification: Referring to the growing number of organic certified sprays on the market that many certified organic farmers use, Betit says: “In addition to being certified organic, we don’t use any f***ing sprays. Period.” In addition, all of the crops are hand cultivated. “We’re literally out there with stirrup hoes and hand weeding everything. 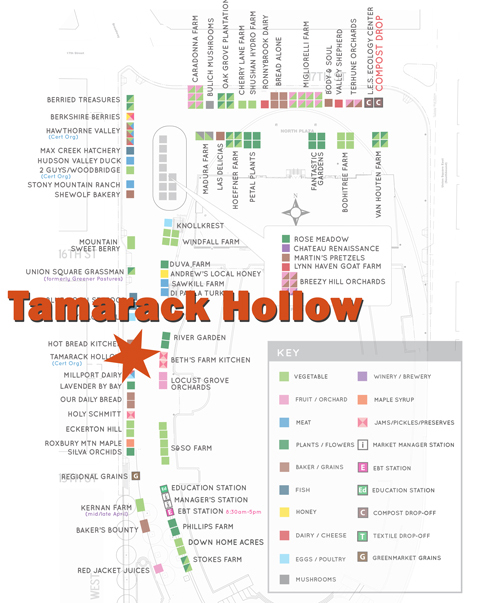 We use intensive rotational grazing, and our vegetables are part of the rotations.” Tamarack Hollow Farm is 88 acres in its entirety, but only 3 1/2 acres are cultivated at any one time, giving the soil time to recover. The only problem, Betit told me, is that the soil is sometimes too fertile, recently leading to a ridiculously large cabbage. 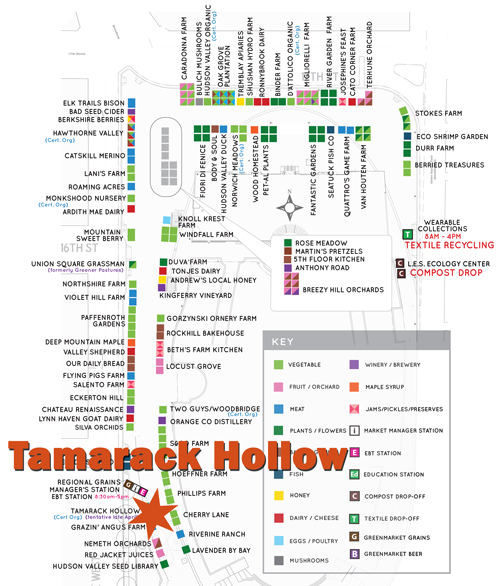 As the season progresses, Tamarack Hollow will be at the market year round. When the weather gets colder, look for greenhouse microgreens and sprouts, as well as spinach and baby kale that are grown in low tunnels. Of course, the meats will be available all year long. Check out the slideshow for a look at what Betit had to offer at last week’s maket. See the full story here. Photos by Ben Fishner. We attend Union Square Wednesdays year round, and can be found on the west side of the market about half way down, near 15th street. 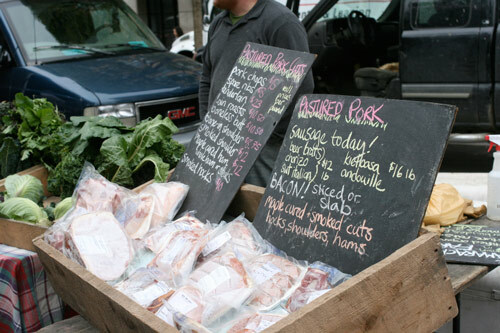 We attend Saturdays from roughly May through Thanksgiving, and can be found on the west side of the market, at the south end between the Gandhi Statue and the Manager's Tent. For our soft launch during summer 2016, delivery is available in Manhattan south of 72nd street and North of Chambers. We are not currently making deliveries in the Financial District or Brooklyn, but stay tuned for updates on an expanded delivery radius. If your location is outside these neighborhoods, we will gladly pre-pack your order for pickup at Union Square. Please email to see if and when we can accommodate delivery. If you are outside of our delivery radius, you can still receive a weekly produce list and we will happily box your order for easy pickup at the stand. Copyright 2016 © Tamarack Hollow Farm.